Travis Miller’s interest in water began early on, during childhood when he would walk the several blocks from his Traverse City home to a nearby beach. He couldn’t have imagined then, however, that this same stretch of shoreline would one day be where he’d find himself studying water — both freshwater and saltwater, thanks to an internship overseas. 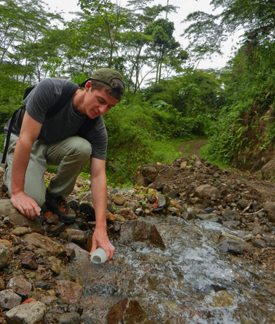 Miller, who is enrolled in NMC’s Freshwater Studies program, was among eight students who spent two weeks in Costa Rica in the summer of 2012 to learn not only about water management and the similarities between saltwater and freshwater, but also environmental sustainability and the role communities play in these efforts. The students — five are enrolled in the Freshwater Studies program while three are studying at U-M or MSU — spent the internship at Escuela de Agronomía para la Región Trópical Húmeda, also known as EARTH University. 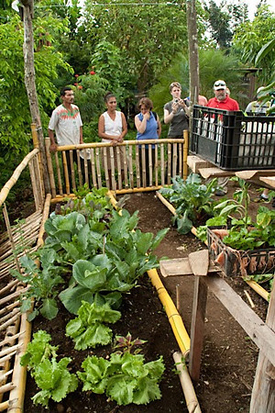 The university, which has campuses in Guanacaste and Guácimo, focuses on both entrepreneurship and agriculture. Better understanding how economy, society and the environment are intertwined was behind the Costa Rica internship, said Constanza Hazelwood, coordinator of NMC’s Great Lakes Water Studies Institute, who traveled with the students. “It was a wonderful way to connect different lifestyles, different economic activities that have an impact on the environment and how the environment has an impact on the people,” Hazelwood said. Freshwater Studies student Martha Aguilera said she was inspired by Costa Rica’s environmental progressiveness, particularly on the university campuses. Students learned about waste management on the campus and how it’s used for energy for the cafeteria, for campus farm animals, even irrigating the greenhouse. The Michigan students were impressed with EARTH students’ community involvement. The trip purposely coincided with EARTH’s annual student fair, an event that attracts some 10,000 people, Hazelwood said. The Feria América Tropical at EARTH University consists of students displaying their year-end projects — a business plan of sorts — that often go on to become viable local businesses with help from loans given out by the university. The event includes music, food and dance from 27 different countries. “The take-home lesson for us was, let’s help the students come up with ideas and support innovation,” Hazelwood said. A visit to a local beach — Playa Ostional — allowed the students to learn about the controversial practice of harvesting Olive Ridley Sea Turtle eggs. While environmentalists are against this activity — the eggs are sold at market for food and for use in drinks — plenty of others find it acceptable because they believe the eggs wouldn’t all survive anyway. “It is a controversial topic that we had the chance to discuss among ourselves,” Hazelwood said. Students held water quality workshops with the community, including demonstrating the watershed model and how what happens at the top of the watershed would affect those living and working at the bottom of the watershed. They also gave presentations in Spanish about northern Michigan and its assets. Students shared their experiences on blogs they created specifically for the trip. They were asked to write their posts in Spanish; some students already are fluent in the language while others were introduced to Spanish during a pre-internship Spanish “boot camp” as well as throughout their time in Costa Rica. The Costa Rica experience fired up the students to want do more for the environment and community back home, Miller said. Hazelwood said after the 2012 trip that she hoped to take another group to Costa Rica in the future.